Friday, May 18, 2018 at 10:24 a.m.
Pilots at Fairchild Air Force Base wouldn’t think of taking off without running through their checklists. When you’re launching an air tanker, there are just too many pre-flight duties the crew can’t afford to overlook without some pretty serious consequences. 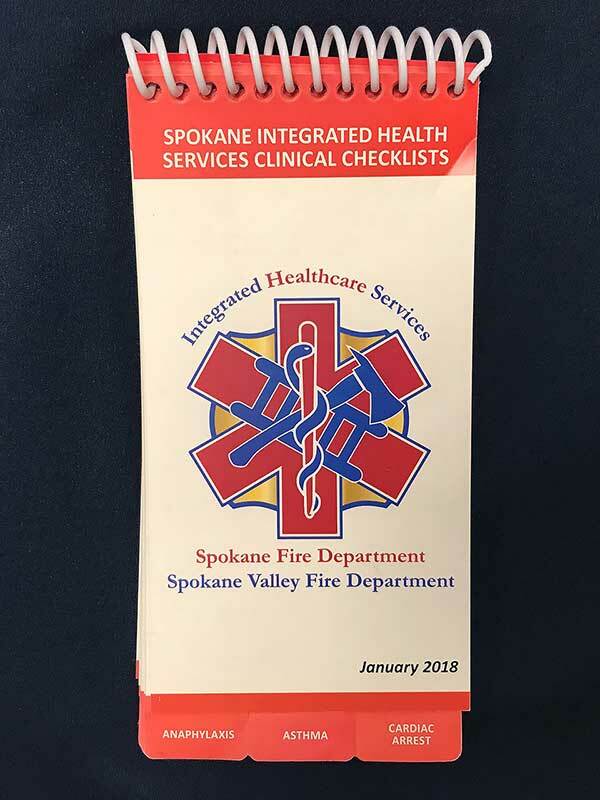 So now, taking a hint from the cockpit, the Spokane Fire department wants its EMT’s and paramedics to refer to a pocket-sized checklist when caring for their patients in the field. The spiral notebook covers everything from chest pains to strokes. “There is no question that good, quality pre-hospital care results in improved outcomes in the hospital and after discharge home from the hospital,” said Dr. Joel Edminster, medical advisor for the City of Spokane Fire Department. Two heads are usually better than one so just like inside the jet, where crews tag team their list, firefighters will also be using the “challenge and response” method. “In a chaotic environment, sometimes it’s nice to have that cue that we’re doing all the critical things,” Edminster said of how the checklist could be helpful. For example, there’s a checklist for someone having trouble breathing because they suffer from COPD. “So we would ensure that Albuterol and Atrovent are administered,” Edminster said going through the nine items on the checklist. And while you might figure asking highly trained paramedics to reach for a checklist might be a little insulting, their pride takes a backseat to treating their patients. “They’re a proud group of people but their pride is based on the fact they deliver quality care and whatever tools we provide them with to deliver the best care, they’ll take it and they’ll use it,” Edminster predicted. So when seconds count, EMT’s and paramedics are fighting to give you your best shot at survival and a speedy recovery. Edminster thinks the new clinical checklist will help firefighters get the best results possible. “This is another example of how our fire agencies are committed to providing the absolute best care available to the people we serve,” Edminster said.